Today was definitely a diamond day. The weather was brilliant as I travelled from Coff’s Harbour to visit friends in Grafton. 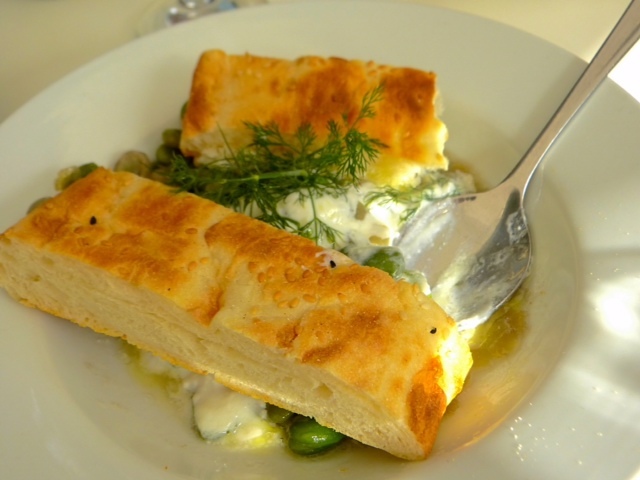 Over a delicious morning tea they mentioned a great Turkish restaurant in nearby Yamba. And so I met talented Turkish born chef and author Sevtap Yüce. 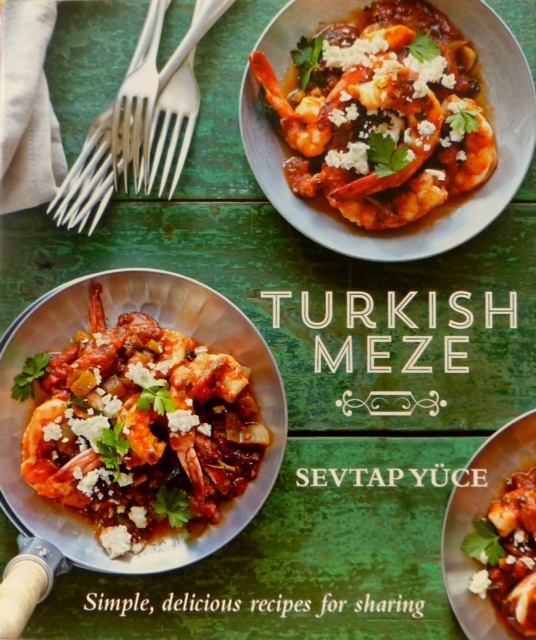 Author of two books on Turkish cuisine (‘Turkish Flavours Cookbook’ and ‘Turkish Meze Cookbook’) Sevtap has woven her own fresh Australian flavours into traditional Turkish dishes. As her website blurb reads Sevtap loves nothing more than ‘eating out of the earth’. Not only does she cook with the products supplied from her own garden, she sources produce from local farmers. Sevtap moved to Australia from Turkey at the age of 17. 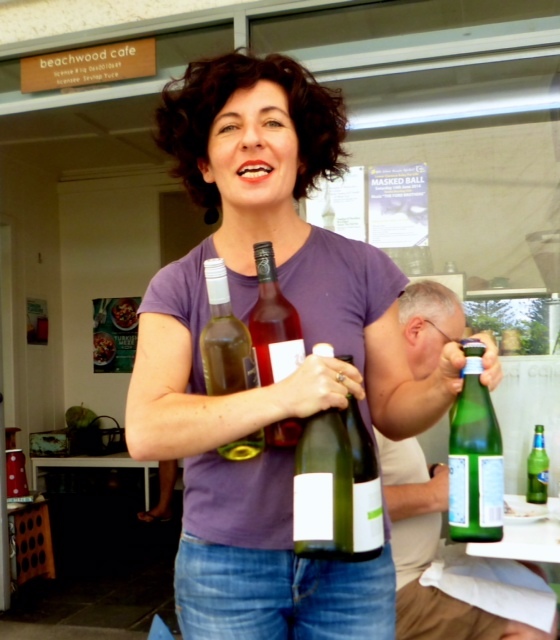 After a decade in Sydney, learning English while working in a patisserie in the Inner West plus a stint at Bill Grangers’s cafe, Sevtap moved to Angourie on the New South Wales North Coast and opened her restaurant, Beachwood in Yamba in 1994. It just so happened that today was the last day that her Yamba restaurant Beachwood Café would be open for 10 days from today (May 21st) so the menu board was quite sparse, but the resulting food was sublime. Now this is a travel blog so I’ll resist the urge to include some recipes but suffice to say the food was to die for. The kitchen is tiny but what taste treasures appeared… with great charm and personal service, Sevtap was right on the front line, checking with patrons, taking orders and jollying the locals. When I asked her what wines were available she appeared moments later with all the bottles so I could make a choice. 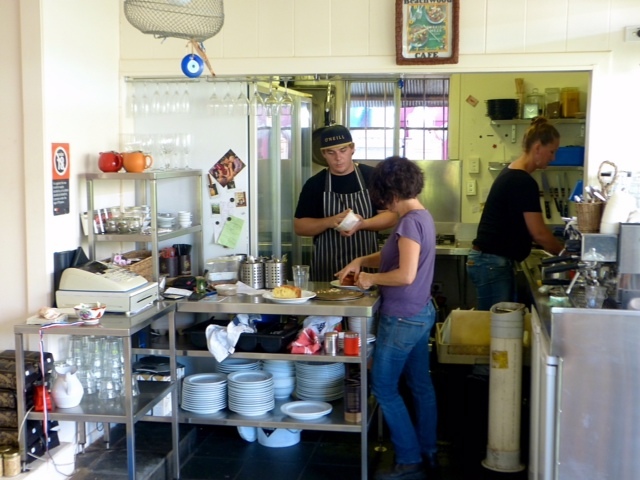 If you’re anywhere within 200kms of Yamba make an effort and enjoy this hidden treasure of culinary charm. 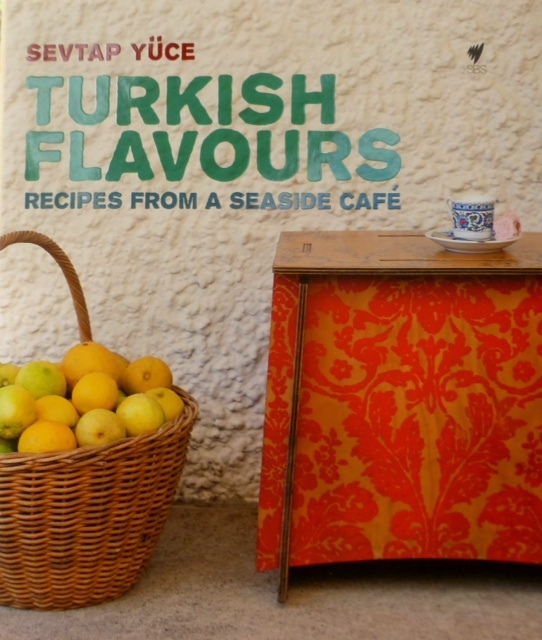 And while it seems that Sevtap is having a break, she is actually taking the time to complete her third cookbook. So get on her website to buy the first two! 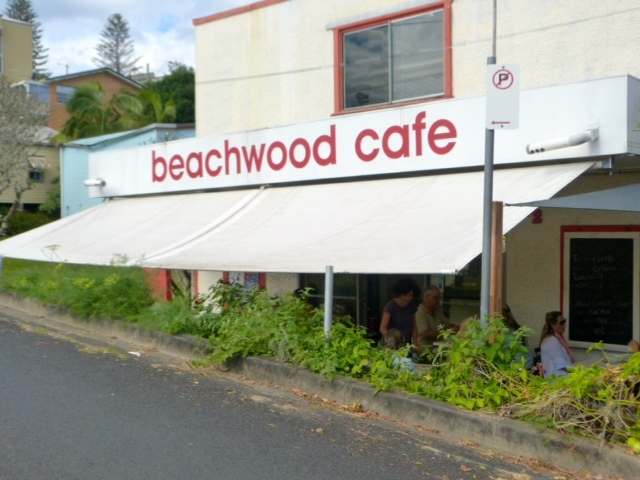 Beachwood Café is tucked away on a peaceful side street, right in the heart of town at 22 High Street in Yamba. Usually open on Tuesday through to Sunday. 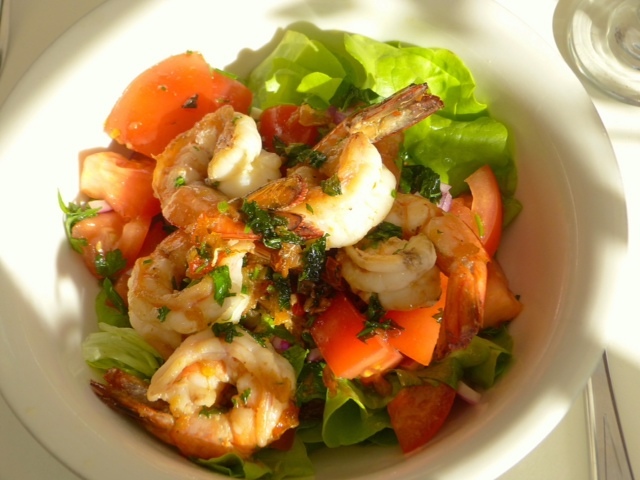 Lunch menu is available from 11am – 3pm. Please note: Beachwood is closed on Mondays. 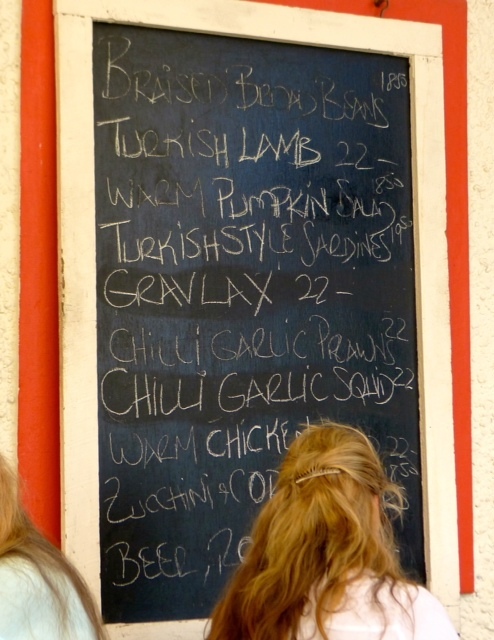 Beachwood is a licensed cafe, a selection of wine and beer is available to compliment the lunch service. This morning when checking our web analytics, I noticed that we had some traffic from the Bendigo Theatre Company. 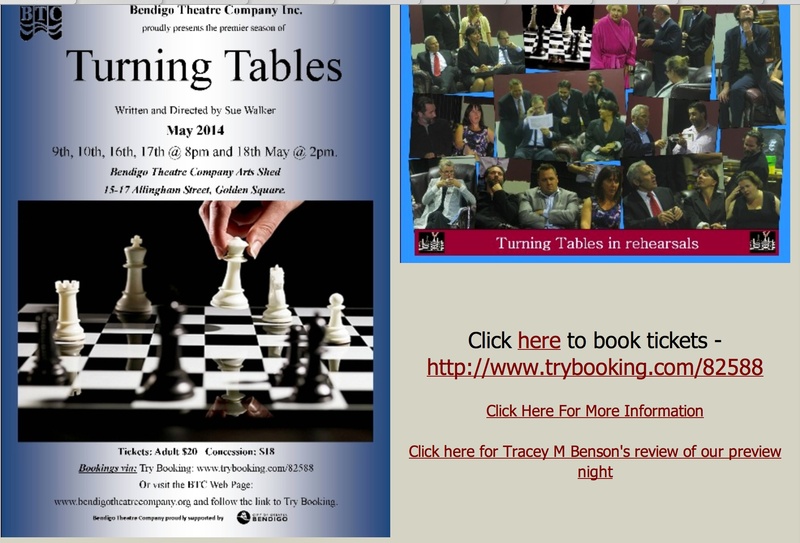 I was very curious, so headed to their website to find they had put a link to my review of Turning Tables on their front page! Thank you so much for sharing my review BTC and I hope that Turning Tables is a roaring success. Tonight we were very privileged to be invited to the preview of emerging playwright Sue Walker, titled Turning Tables. 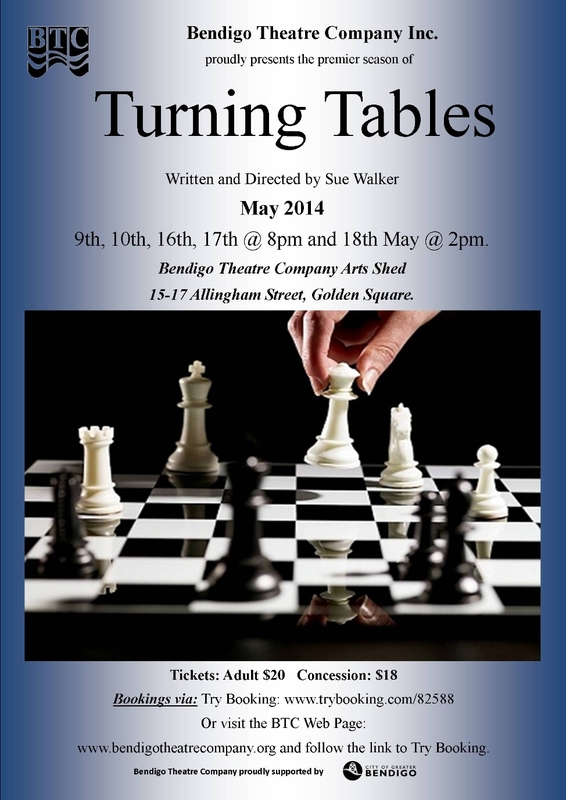 The play is being held at the Art Shed of the Bendigo Theatre Company. I will say up front that I am a friend of Sue Walker. I was very fortunate to work with Sue last year when I was seconded to the Yorta Yorta Nation Aboriginal Corporation and we became good friends – sun sisters we call each other. It was a strange combination of having creative passions outside of the 9-to-5, a belief in the workings of the universe and a united love of the ridiculous that somehow cemented our relationship. During the time we worked together, we formed a bond that we knew would continue long after the 6 week secondment. Sue had given me a copy of the script last year when we were working together, so I had a good sense of the story but for some reason to see it live gave me an entirely different perspective on the story; as it literally ‘came to life’. Now I am no theatre critic by any means, but I love a good story and strong characters, especially female characters. Turning Tables has all of this. Add in a stellar cast and you have an evening of tears and laughter with a conclusion that makes you believe that there is justice in the world. The story centres around the family matriarch Ettie, who is dying. Despite efforts to diminish her authority by a number of family members, she is able to have the last word, and does it ‘her’ way. Margaret Trainor who plays Ettie is delightful in the role as the straight talking, whisky sneaking, sharp as a whip protagonist. I could not help thinking of my own Yorkshire born grandmother who is now 93 and very frail but who still manages to call the shots. There is a big message about respect in this play – respect for each other and respect for the wisdom of elders. In a society where age equates with diminished human value, this is a refreshing point of view. 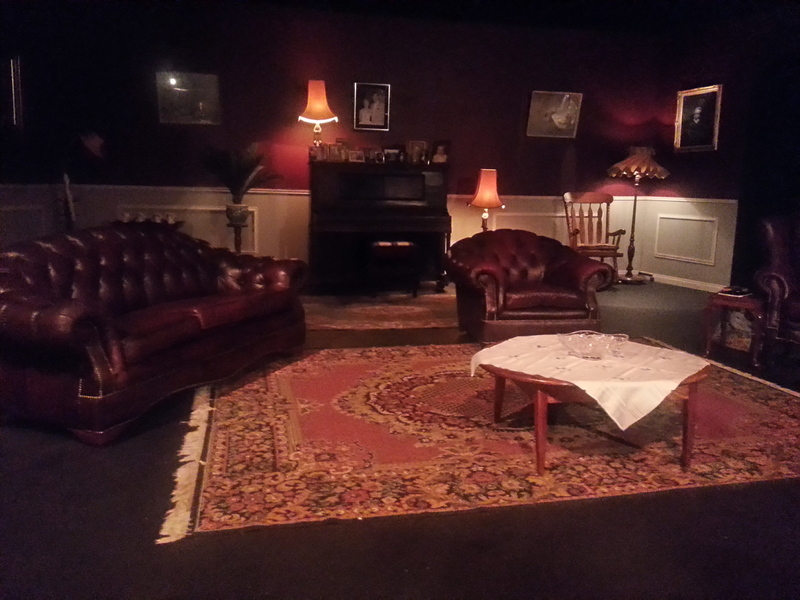 The set design is sumptuous, flowers in vases, a mantle filled with family pictures and a gorgeous leather couch which is the centre of the action. What is really lovely is that the mantle is filled with pictures of the cast and Sue’s family in years gone past, which speaks of Sue’s sharing nature. On the sideboard there is a photograph of the real Ettie, Sue’s Irish great-grandmother, watching on with approval I am sure. It was a great night, meeting lots of lovely people and catching up with some familiar faces. 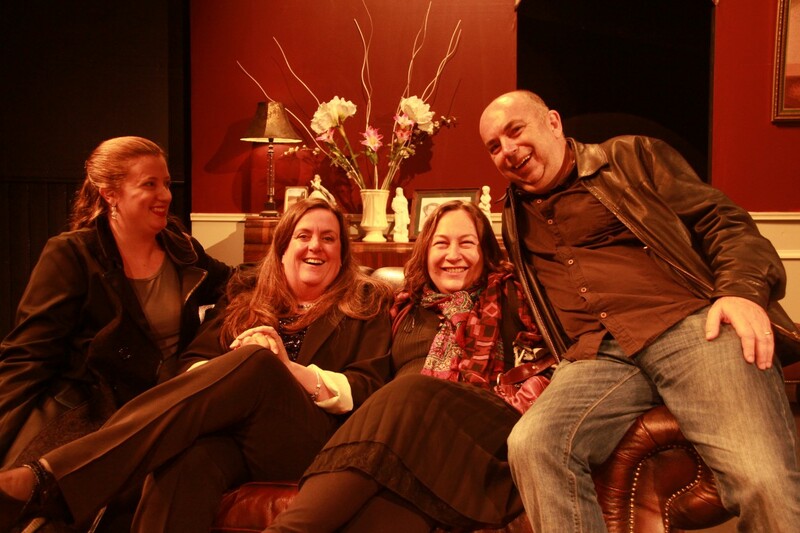 Also met the local MP, Lisa Chesters who seemed to have a great time at the play. The play opens to the public on May 9 and continues until May 16. If you get in quick, you can win tickets to the opening by liking a post on the Bendigo Theatre Company’s Facebook Page. A reblog from Graphic Design Canberra of David Flanagan’s beautiful work, which we wrote about in an earlier post titled Canberra day trip to Bungendore. We pass it every now and again when we travel north and it signifies we’re almost home. People tell mysterious stories about where all the water went and eerie happenings from the past that occurred on the land. But since moving south of Goulburn with a view of this expansive lake, I have a new appreciation for how beautiful Lake George really is.